In my experience, every little boy and girl goes through a "dinosaur stage" between the ages of 5 and 10 -- a time when these extinct creatures play a crucial role in their developing imagination. This is so, probably, for many reasons. For one, there are so many different varieties of dinosaurs to learn about -- with various qualities -- that they seem like prehistoric Pokemon. You can spend weeks and months learning about the different types of dinosaurs and their behaviors. Secondly, it's amazing for both children and adults to contemplate the idea that these giant creatures once roamed our Earth....long before we did. In that sense, they are "real" in a way that dragons, perhaps, are not. Similarly, the death and extinction of the dinosaurs so long ago is a potent lesson to students of all ages. Nothing lasts forever. Everything has its time. Even monsters that seem as mighty and powerful as these "terrible lizards." But cult-TV history, in many ways, has been the time of the dinosaurs. They have appeared again and again, over the decades, to inspire and entertain audiences, and remind us both of the distant past and fears about future, and the extinction of man. A dinosaur was seen from a fly-over point-of-view, early on in TV history, in The Twilight Zone's 1961 story "Odyssey of Flight 33." There, a modern airliner slipped through a time warp, and cruised over the New York area only to be confronted with visions of dinosaurs. On the same series, an episode called "It's a Good Life," about a wicked boy (Bill Mumy) with extreme mental powers and abilities, featured a clip of dinosaurs. Specifically, the boy would only allow the adults of his town to watch TV if they watched his self-created program...one which concerned dinosaurs endlessly battling it out. Dinosaurs have appeared on episodes of Doctor Who -- old (1963 - 1989) and new (2005 - present) -- for over forty years. 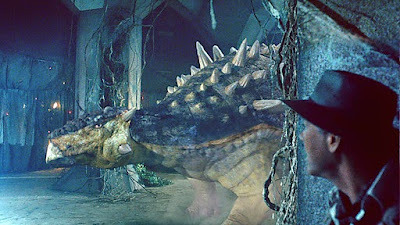 The Third Doctor (Jon Pertwee) battled them in a serial titled "Invasion of the Dinosaurs," while the Eleventh Doctor (Matt Smith) had to rescue many of these reptiles in "Dinosaurs on a Spaceship." 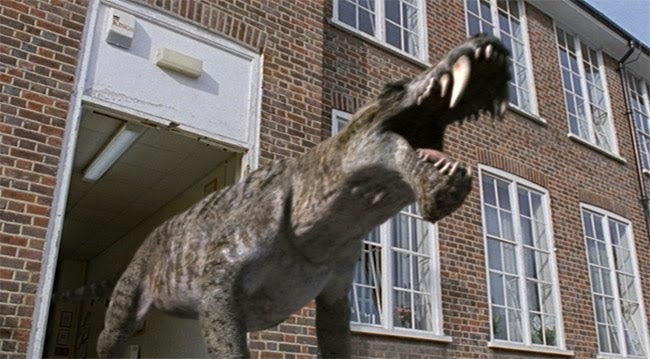 Recently, the era of the Twelfth Doctor (Peter Capaldi) was inaugurated with a view of a T-Rex in Victorian London, in "Deep Breath." 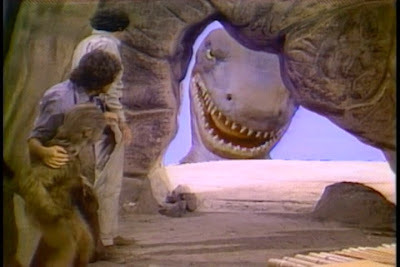 Given the affinity children have for dinosaurs, it is appropriate that Saturday morning television has often focused on them too. 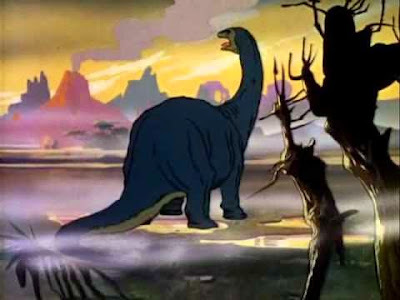 In 1974, both the live-action Land of the Lost (1974 - 1977) and the animated series Valley of the Dinosaurs premiered, offering children the opportunity to see modern families contend with these prehistoric beasts. 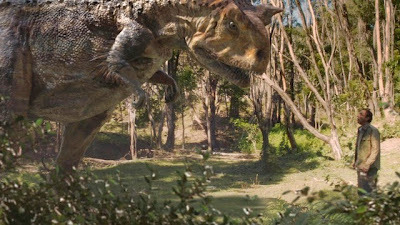 Indeed, if you gaze at the Jurassic Park films, they resurrect a key aspect of both Land of the Lost and Valley of the Dinosaurs: children play a key role in the dino-centric stories. Both the films and these TV shows are about families bonding, while running from giant-sized dino-threats. 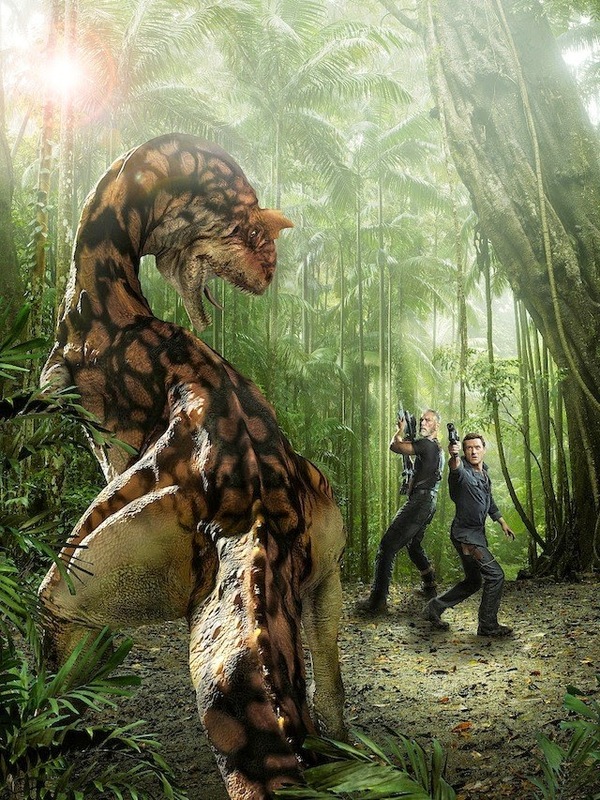 Advances in special effects technology in the last decade have resulted in -- surprise -- more dinosaurs on television. Series such as Primeval (2007-2011) and Terra Nova (2011) both featured these extinct animals on a regular basis. 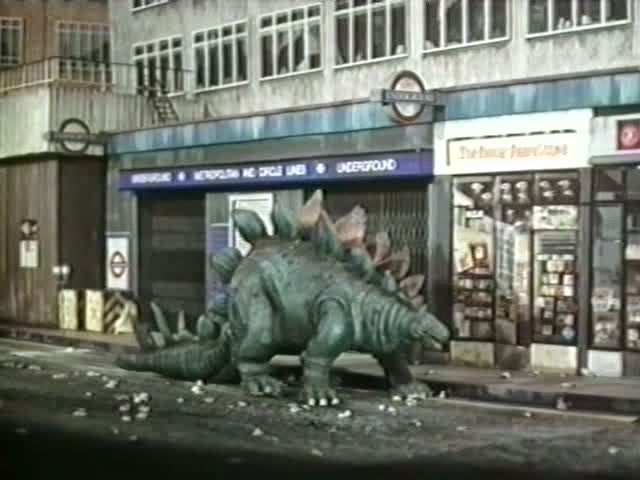 In the case of the former, gateways or portal from prehistoric times were opening into modern-day London, bringing dinos with them. In the latter case, future man traveled back in time to colonize the prehistoric past. Basically, you can find dinosaurs in a variety of cult-TV programs, of any sub-genre. There was a sitcom about a blue-collar family of them called Dinosaurs (1991 - 1994). The X-Files (1993 - 2002) featured an episode titled "Quagmire" about a Loch-Ness-like dinosaur called Big Blue living in a Southern lake in the United States. The crew of the U.S.S. Voyager encountered a race of evolved dinosaurs in the third season Star Trek: Voyager (1995 - 2001) episode "Distant Origin," and so on. Dinosaurs are extinct today, but the love for these "monsters" goes on in our popular entertainment, as the release of Jurassic World: Fallen Kingdom (2018) this Friday abundantly proves.